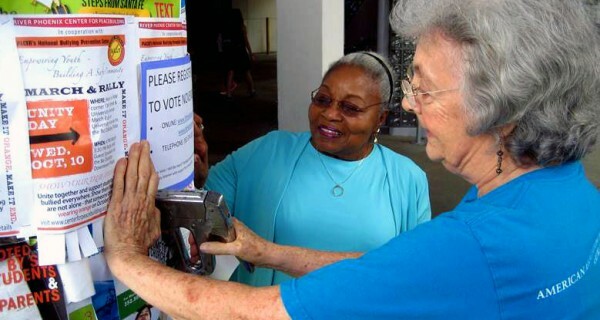 AAUW members in Florida post get-out-the-vote posters in their community. Registering voters is just the first step. Evidence shows that newly registered voters who receive follow-up communications are far more likely to turn out to vote. A truly successful get-out-the-vote strategy must include plans for following up and engaging with those eligible voters you helped to register. Our guidelines below will help you do just that. Provide newly registered voters with voter education content so that they can feel connected and excited about the upcoming election! Contact the new registrants — by e-mail, phone, or mail — to remind them to vote! Invite them to attend your branch’s voter education events like candidate forums and issue forums. Challenge them to ask five friends to register using AAUW’s online registration tool. Voter registration lists are a matter of public record, so states allow third-party registrants to collect information — like names, phone numbers, and e-mail addresses — from completed voter registration forms. Then use that data to reach out to newly registered voters to encourage them to turn out on Election Day. Please note: While it is allowable to contact new registrants with election-related information, it is illegal to use information from a voter registration form for non-election communications such as fundraising, action alerts, etc. However, you can ask newly registered voters to “opt in” to the Action Network to maintain future contact. Refresh your knowledge of AAUW’s Public Policy Program (AAUW’s member-voted guide to our lobbying and grassroots efforts for women and girls) with these tools, then go forth and spread the word! Advocacy is about all citizens concerned with equity being knowledgeable and aware of the current status of important issues. What’s at stake in this election? Find out using the AAUW and AAUW Action Fund’s Voter Issue Guide. Branches with 501(c)(4) tax status can find additional voter education resources from the AAUW Action Fund.